Passion Fruit or alien eggs? Who can tell? 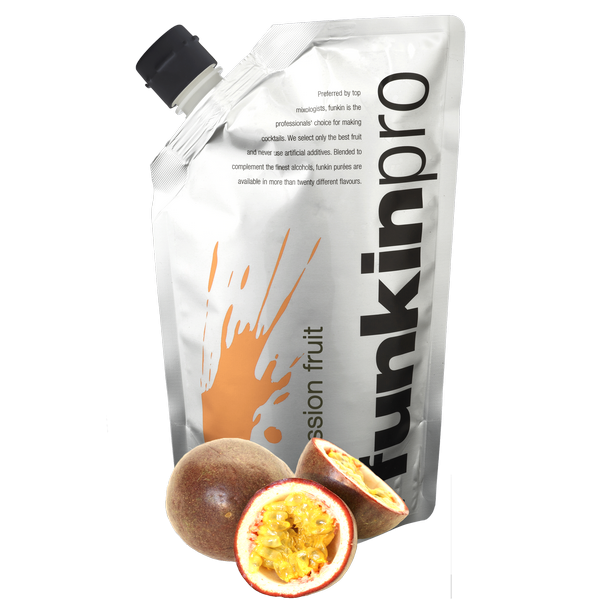 I love the flavour and aroma of passion fruit. I hate the look; not the outside, that's unremarkable, no, it's the whole alien egg cluster once cut open <shudders>. Once the seeds are removed you're left with something resembling an albino testicle. Just me? Maybe. I was after a passion fruit soufflé recipe and found this one in the excellent Great British Chefs site. I was suspicious at first: where's the flour, the egg yolks, the usual custard base? But it works - light, almost fluffy and nicely scented. It works, with one caveat, it needs a sauce; something to add a little richness and tartness. Passion Fruit Soufflé with Passion Fruit Sauce. This soufflé is basically a meringue. Add egg white to a fruit/sugar base. The recipe commits that cardinal cheffy sin of making up a tonne of something - the fruit base - when you only require a tiny amount. I've changed that here. The original also calls for 30 passion fruit. I used 12 and then made up the difference with this from Funkin. Many chefs use commercial fruit purées It's impossible sometimes (most times) to get decent passion fruit. British supermarkets are seemingly determined to sell flavourless fruit at vast cost. 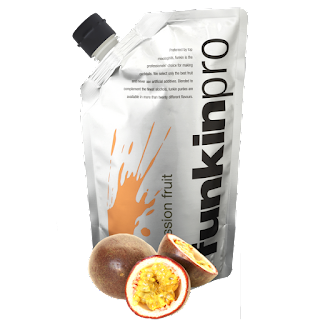 The Funkin range is brilliant: ripe fruit squeezed and pasteurised, sometimes with a little sugar added. The pouches keep for ages until opened. I use the passion fruit, raspberry and especially the cherry. Stay away from the lemon and lime though. Citrus juices are nasty once pasteurised. You may as well swig Jif. Oh, you'll need a sugar thermometer. As we're whisking egg whites, you might want to check our my visual guide. Now you can see what 'over worked' means. First prepare your ramekins. melt some butter and roll it around each ramekin. Place in the fridge for five minutes and then roll some caster sugar around in each. You want a light dusting. If you don't chill the melted butter slightly you'll get a sugary sludge. Put your ramekins back in the fridge. Squeeze out the pulp from six passion fruit. Blend or food process for a few seconds to break up the seeds and strain through a sieve. You can leave the seeds whole if you like your soufflés crunchy. I don't. Add 50g caster sugar to 30g water and a teaspoon of glucose syrup and bring to the boil slowly. Slowly because you don't want the water evaporating before the sugar's dissolved. Once everything's clear and liquid increase the heat and bring the mixture to the 'soft ball' stage - 112°C. Remove from the heat and allow to cool for five minutes. Stir in the passion fruit juice and again bring back up to 112°C. Allow to cool a little while you whisk up six egg whites to soft peaks. Pour the sugar mix into the egg whites and whisk in until incorporated. Fill the ramekins to the brim with the mixture, ensuring no big air cavities. Level with a knife. Wipe all around with a damp cloth to ensure you serve nice, shiny white ramekins and not something that looks like it's been rolling around in the garden. Bake at... now the original recipe rather cunningly does't give a temperature, so I had to experiment. I've found 210°C to give the best results. Any cooler and the mix doesn't rise fast enough before it cooks. So, yeah, 210°C for seven minutes. And with this recipe it has to be seven minutes, a few seconds longer and you're serving delicious, if overcooked, omelette. Sprinkle with icing sugar and serve immediately. I ask my guests to make a hole in the top and then I walk around, pouring the sauce straight in. Remove the pulp from three passion fruit - no need to pulverise the seeds here - and mix with a table spoon of sugar syrup (1:1 water and sugar brought to the boil) and a couple of tablespoons of lemon curd. Mine was home made but there's plenty of decent shop bought. Lemon curd is mainly egg yolk and I think this soufflé needs that richness added. Taste and adjust. You want a fairly tart sauce to contrast with the sugar pillow.